Eighty years ago, the advent of summer meant the arrival of the Chautauqua in Middleborough. Originally begun as an adult educational program in 1874 near Chautauqua, New York, the Chautauqua movement of lectures and entertainments rapidly became institutionalized throughout America and reached an even greater audience following the turn of the century when commercialized travelling Chautauquas were inaugurated. These so-called circuit Chautauquas consisted of lectures, music and other entertainments and were held from three to seven days beneath enormous circus tents. The intent of the entire movement was to bring cultural and educational events to smaller rural communities which might otherwise not have an opportunity to experience them. Middleborough was a relative late-comer to the Chautauqua movement, its first one being held in August, 1917. Though the event proved popular, it was overshadowed by the draft drama then being played out in town, as anxious residents focused their attention upon which young men would be drafted into military service. Nonetheless, despite this somewhat hesitant start, the event proved popular enough to be continued another fifteen plus years. Patrons should be reminded to 'get the habit' in vogue at all established assemblies of taking with them a 'sofa cushion.' They will find that this little 'fussing' will add materially to their enjoyment of the session. At the established assemblies you will see the people going auditoriumward by the hundreds, each with a cushion under arm. A serviceable palm-leaf fan may "come in handy." The Middleborough Chautauquas, with their afternoon and evening sessions, were held each year in a large tent in the rear of the Bates School on South Main Street, thereby temporarily conferring upon that plot of land its status as Middleborough's Chautauqua Grounds. Patrons could purchase tickets for individual sessions or for the entire course ($2.00 in 1917). Sessions were held throughout the day though the most popular and the most heavily-attended occured at night when patrons sat on folding wooden chairs in the illuminated tent hoping for a breeze to mitigate the heat. The Chautauqua movement peaked at about the time Middleborough came to be involved, and, in certain years, it proved a truly momentous event. The 1919 Chautauqua combined with the Independence Day festivities and the celebration of the town's 250th anniversary to create a truly festival-like atmosphere in early July that year. The Middleboro Gazette generally devoted much coverage to each year's Chautauqua, and the Junior Chautauqua for children is still, today, probably fondly recalled by older residents. Sadly though, the Chautauqua movement ultimately degenerated into a largely commercial venture dominated at times by religious, temperance and conservative political lectures. Middleborough's 1922 Chautauqua featured a lecture by Dr. L. G. Herbert, "one of the deans of the Chautauqua platform", entitled "The Crisis and the Call." Herbert "spoke of the great menace of the large percent of foreign born, of the over 1200 publications in foreign languages in circulation in the United States and of the great American unrest which expresses itself in strikes." Rather than expose rural communities to culture and education, such lectures tended to foster and inculcate among Chautauqua patrons the xenophobia then prevalent following the World War. Additionally, indicative of the growing commercialization of the event, was the fact that much of the excitement surrounding the Chautauqua was increasingly self-generated by Chautauqua advertising men, with the 1922 Middleborough Chautauqua again providing example. 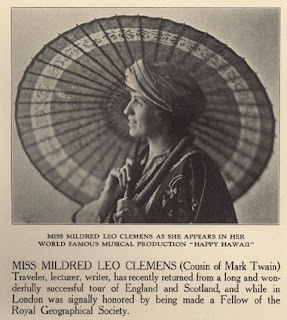 That year's event featured Miss Mildred Leo Clemens' presentation of an illustrated Hawaiian travelogue entitled "Paradise of the Pacific." Heavy Chautauqua advertising billed Miss Clemens as the cousin of Mark Twain, prompting the Gazette to rightly ponder "what Mark Twain would say to having his 'lady' cousin who talks on Hawaii announce on her posters that she is a cousin of Mark Twain. And then we wonder if she can treat the subject any better because she is the cousin of Clemens. And then it comes to us that a little 'blurb' as the new fulsome phrases are called, is not unworkable even in Chautauqua advertising. A little press bunk now and then is useful to Chautauqua men." Such criticism was both justified and on the mark, but it also subconsciously pointed up the increasing silliness of the whole Chautauqua movement in an age when radio, films and the automobile were making cultural attractions much more widely available to rural communities which no longer remained isolated. Additionally, in the particular instance of Middleborough, the community had always been fortunate in being able to avail itself of the same calibre entertainments as provided by the Chautauqua, with lectures, plays, musical evenings and films being presented on an almost nightly basis in the Town Hall. Indeed, the Gazette once proclaimed "that Middleboro has talent enough to make a Home Talent Course of entertainments. Certain it is that we can produce high class concerts, popular drama, minstrelsy, and possibly a lecture or two." These factors all helped undermine the continuance of the Middleborough Chautauqua. Once the holding the annual event under the great tent behind the Bates school was discontinued, the local event tended to lose its novelty, as well as its patrons. Middleborough's last Chautauqua was held in 1928.